Riddle me this: fifty some-odd goths and horror punks waiting outside Irving Plaza with not a single clove cigarette between them. This on the night that extreme metallers Cradle of Filth come to New York City on the most recent leg of the “Cryptoriana World Tour,” aptly subtitled “The Second Coming of Vice.” Maybe it was because it was a sunny Thursday evening, or because the days of skaters and headbangers hanging around Union Square down to Saint Mark’s Place are fading away. Either way, Alternative Control was On the Front Line. Kicking off the evening’s ghoulish festivities was the Los Angeles based ‘sideshow gone metal’ unit Raven Black. Blending goth and metal overtones with a carnival like atmosphere, Raven Black puts a unique spin on theatrics explored by bands like Avatar and In This Moment. A genuine “Please come say ‘Hi!’ after our set!” was the cherry on top of a sweet yet spooky set. In a time when social media lets us market ourselves remotely, it’s always great to see a band still doing footwork to build a fanbase. The man they call Wednesday 13 needs no introduction. Having made his bones (pun fully intended) with Murderdolls and Frankenstein Drag Queens from Planet 13, it was two-step central on the dance floor from the word go. 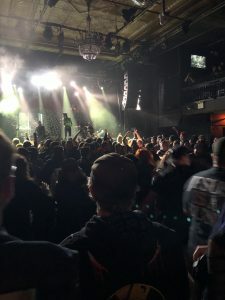 Tearing through a set spanning the most recent three albums, long time fans were even treated to a brand new song entitled “Zodiac.” If only a taste of music still to come, it’s clear that Wednesday’s impressive career is only getting better with age. 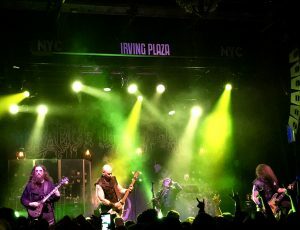 Nearly one year to the day since their visit to the Big Apple, Cradle of Filth took the stage to a deafening roar of excitement. With thirteen albums to their name, not counting EPs, it must be a full time job in itself for the band to decide what songs to cram into an hour and a half set. Still, the band never seems to fail to deliver a stellar selection of rippers and ballads, picking the best of the best from nearly thirty years of releases. After, according to vocalist Dani Filth, “a bit of legal shite and delays,” Cradle is looking forward to the official re-release of Cruelty and the Beast later this year. Celebrating its twentieth birthday last year, the eleven minute opus “Bathory Aria” was at the core of the set. It was bookended by classics including “Her Ghost In the Fog,” “Dusk and Her Embrace,” and “Nemesis,” the latter of which has been off the set list for almost fifteen years. Saint Mark’s Place might no longer be the haunting grounds for New York’s grimmest, but the city has obviously retained its love for the bleak and dark. Keep your eyes peeled for the twentieth anniversary edition of Cruelty and the Beast, and be sure to head to your favorite record store to pick up a copy. For more from Alternative Control, find us on Facebook, Twitter, Instagram, Youtube, Soundcloud, and bandcamp.